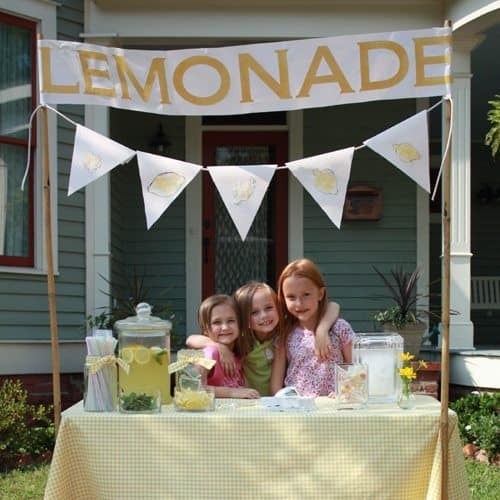 Open the Cutest Lemonade Stand on the Block! Though my children are already back in school, the summer heat is far from over around here. Last week the kids cooled off and earned some extra cash with a lemonade stand. I always love to encourage the entrepreneurial spirit in my children and they even decided to give some of their earnings to charity. 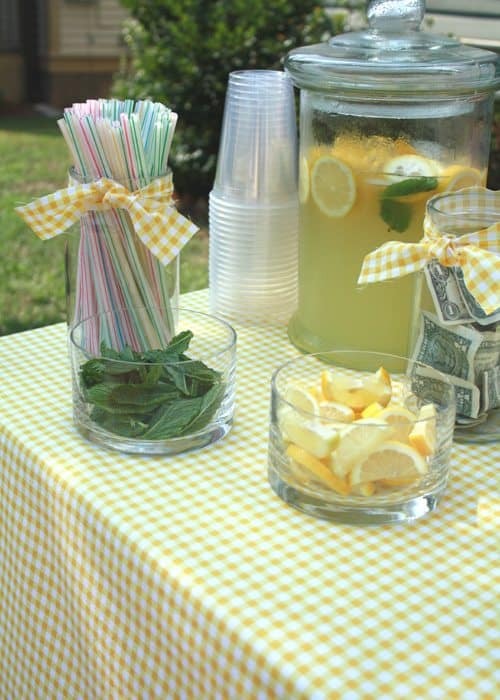 There are also lots of non-profit organizations that have lemonade stand fundraising programs. The kids enjoyed squeezing the lemons to make homemade lemonade and made the brilliant discovery that wearing swimming goggles would keep the juice out of their eyes. Here’s the recipe we used, but you can easily adjust it according to your preference for more sweet or sour. The key is to use hot water to melt the sugar before adding the lemon juice. And you should know it takes a lot of lemons to make lemonade! Heat the water until boiling, then add the sugar until dissolved. Stir in the lemon zest. Allow to cool, then add the rest of the water and the lemon juice. Garnish with fresh lemon slices and mint leaves. Serve over ice. that is the CUTEST lemonade stand!! So adorable! Thanks for sharing the banners and flags. We literally just hit a lemonade stand yesterday and I was just thinking about this topic! Beautiful pictures. thanks! How sweet and I am sure your kids loved it! Wonderful pictures. What a lovely summer tradition. So cute! I recently saw this one – they had lemon shaped signs!